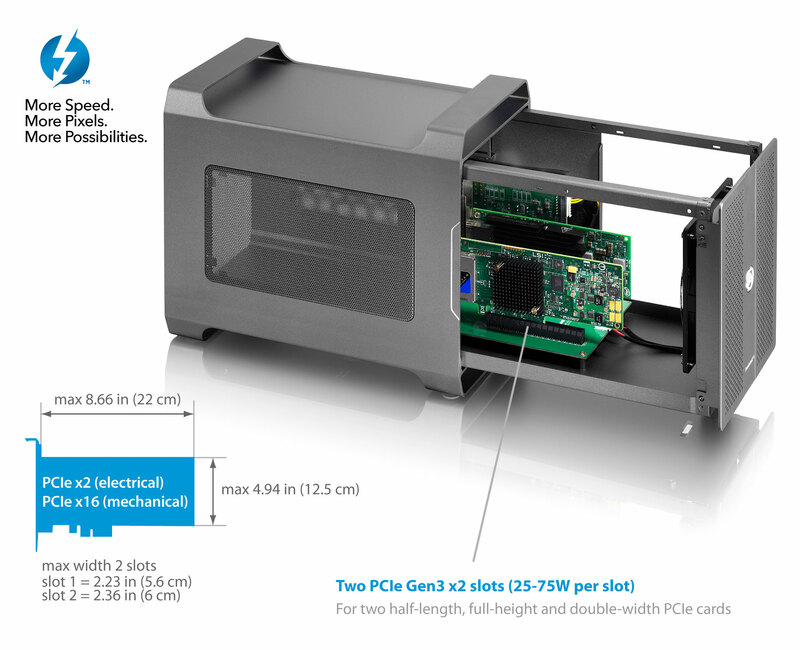 The Node Duo, with space enough for two half-length PCIe cards, is the ultimate plug and play expansion kit for Thunderbolt 3 computers (e.g. laptop computers) where installing an internal expansion card is not an option and for systems where there is not enough space for more PCIe cards. 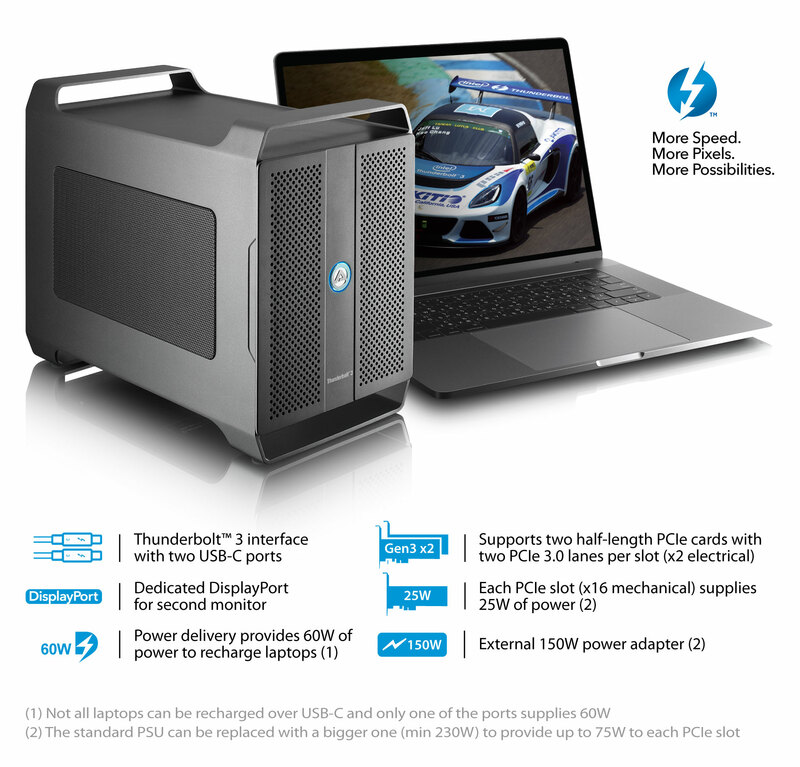 The Thunderbolt 3 (USB-C) connection not only makes adding an external PCIe card easy but it also allows you to take the device with you to use on location and move it from one system to another. The two PCIe slots accept half-length, full-height, double-width cards and provide 25W of power each. If only one PCIe card is installed and the power delivery function is not used, the PCIe slot can provide up to 75W of power. For PCIe cards that require more power, this device can be modified accordingly. For more power, the included 150W power adapter can be replaced with a bigger power adapter (min 230W), making it possible to provide up to 75W of power to each slot. For even more power, the breakaway-tab on the back panel can be removed to create an opening, which can then be used to run a cable from an additional PSU like our 500W SFX PSU directly to the PCIe card (e.g. 6+2-pin PCIe power cable). The reversible USB Type-C (USB-C) connector enhances ease of use for connecting devices with a focus on minimizing user confusion for plug and cable orientation. The Node Duo also supports power delivery (PD) over USB-C, providing up to 3A at 5V, 9V, 15V, 20V with a maximum of 60W of power to compatible laptops like the MacBook Pro (late 2016) that support charging through the USB-C cable or for devices like the iPad Pro. This allows you to recharge your battery even though the laptop is not plugged into any other power source. 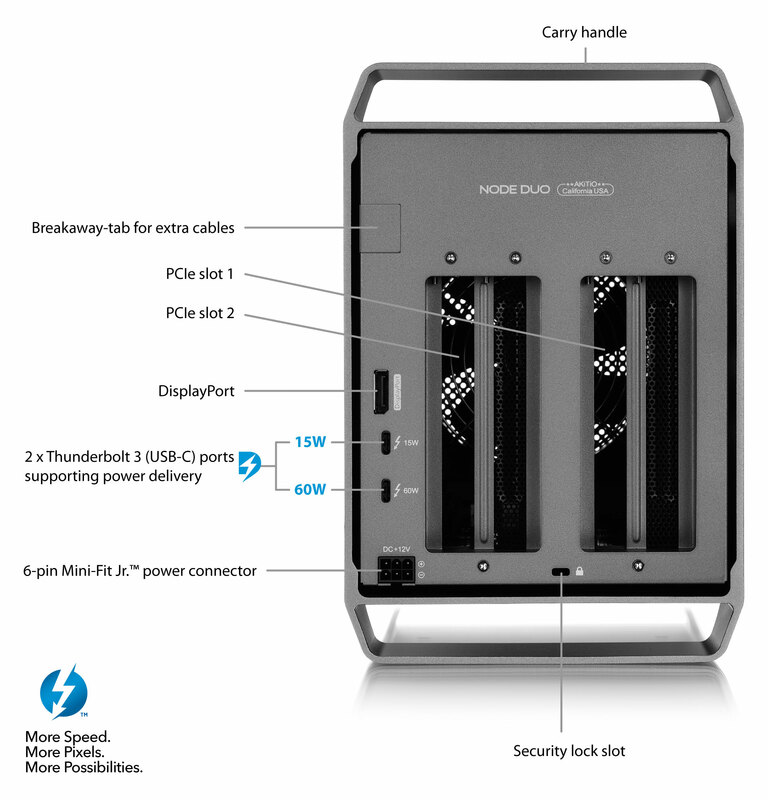 The Node Duo has two Thunderbolt 3 ports. 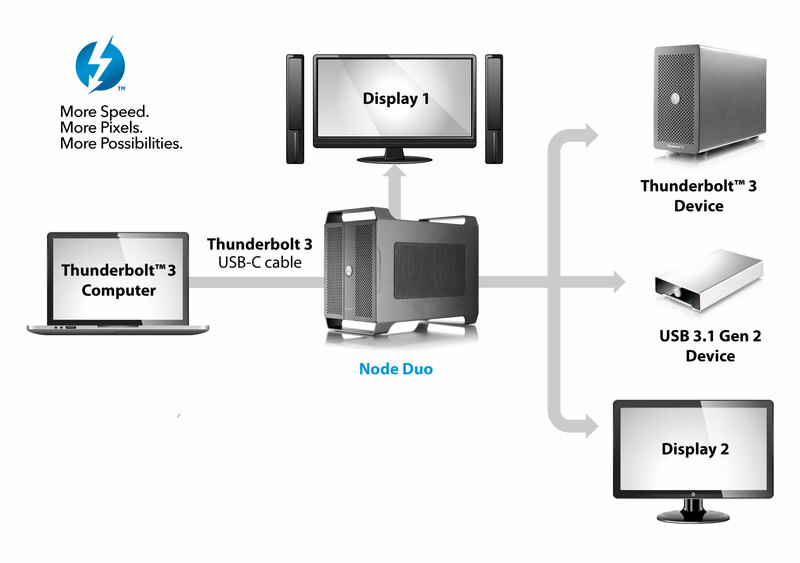 The second port operates the same as a Thunderbolt 3 computer port by supporting Thunderbolt 3 (up to 5 daisy-chained), USB 3.1 (10 Gbps), and DisplayPort devices. [Node Duo] What happens if I install a PCIe card with four PCIe lanes? [Node Duo] Can I install a card that requires 2.5 slots? [Node Duo] Can I install a full-length PCIe card? [Node Duo] Can I install a PCIe card that requires more than 25W of power?